The 2017 season is over for St. Louis Cardinals closer Trevor Rosenthal. Cardinals GM Mike Girsch announced Wednesday that Rosenthal will undergo Tommy John surgery next week, less than a week after being put on the DL with elbow irritaiton. Earlier in the day, the Cardinals transferred Rosenthal to the 60-day DL, effectively ending his season. Rosenthal went on the DL last Thursday after complaining of tightness in his elbow during an outing. After seeking a second opinion on the injury, his fears about irritation near the ulnar collateral ligament have been confirmed. Tommy John surgery will keep Rosenthal sidelined for the rest of the season, and most if not all of next season as well. 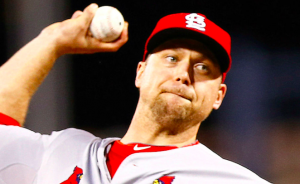 Rosenthal served as the St. Louis closer in 2014 and 2015, as well as parts of the past two seasons when he hasn’t been held back by other injury issues. A rotator cuff problem sidelined him for two months last season, while a strained lat suffered in spring training forced Rosenthal to begin this season on the DL. In 50 appearances this season, Rosenthal is 3-4 with a 3.40 ERA. He has 11 saves in 13 opportunities and is averaging well over a strikeout per inning. Rosenthal was almost un-hittable coming out of the all-star break, helping him regain the closer’s job. However, he struggled in his last two outings, with discomfort in his elbow likely playing a role. With surgery on the horizon, Rosenthal’s career and his time in St. Louis both appear to be at a crossroads. The 27-year old has spent his entire career with the Cardinals. However, he has just one year of arbitration remaining before he enters free agency. If the Cardinals aren’t sure if Rosenthal will be able to return next season, they could choose to non-tender him this winter, leaving him unattached as he goes through his rehab. Relievers tend to come back from Tommy John a little faster than starters. But there’s still no guarantee Rosenthal is back in the big leagues before the 2019 season. As for the Cardinals, they now know for certain that they will have to traverse the rest of the season without Rosenthal has their closer. Seung Hwan Oh will likely step into the closer’s role for the rest of the season. On the season, Oh has closed out 19 of 22 save opportunities, posting a 3.69 ERA. However, he’s not been quite as dominant as Rosenthal this year and doesn’t throw nearly as hard. In general, the St. Louis bullpen has been middle of the pack compared to others in the National League, especially once you take Rosenthal out of the equation. Tyler Lyons, John Brebbia, and Sam Tuivaliala are all in the midst of impressive seasons in setup roles. But none bring the kind of track record or experience that the Cardinals are losing with Rosenthal. The Cardinals have some good pieces in their bullpen, but they may still struggle to replace Rosenthal down the stretch. St. Louis began Wednesday nursing a three-game losing streak. They currently sit 4.5 games behind the Cubs in the NL Central and 5 games out of the second wild card spot. They remain in contention for both spots, but face a steep climb to get into the postseason. The news that Rosenthal is officially done for the season will make it that much harder for the Cardinals to find their way into the playoffs.